Designed Stairs has successfully completed over 150,000 stair projects and provide custom stair products across the United States, and have exported to Japan, Europe and South America! Our designers, craftsmen and installation team have the technical expertise to create any staircase imaginable. Crow Woodworkers is a Chicago-land based, manufacturer of wooden stairs and wooden wall decor. 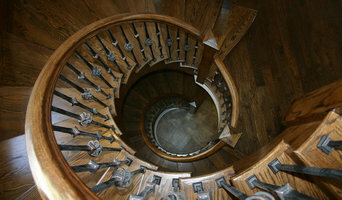 Crow Woodworkers works with designers, homeowners builders and architects to design and build stairways. We offer best quality materials, experienced and knowledgeable staff. Our great customer service is here to help you with any stairs or wooden decor related questions. Design Build of commercial and residential metal and glass staircases and railings, feature walls, partitions and architectural metal and glass applications. Lake Shore Stair Company is a fourth generation family owned company dedicated to innovative designs that carry a classic legacy throughout North America. Since 1932, Lake Shore Stair Company strives to achieve quality craftsmanship in every stair and rail project we have undertaken. From design consultation through the manufacturing process and expert installation, every project, small or large, is performed with exacting detail. At Lake Shore Stair Company, it is our goal to create a beautifully crafted stairway whose strong form and function are masterfully blended with timeless style and grace... A stairway that will please and enhance your home for a lifetime. We look forward to having you as our client. At HL Stairs Inc., we recognize that no two homes are alike and no two people have exactly the same tastes. The flexibility of our collections makes them infinitely acceptable for today’s needs. Whether it’s the deep tones of cherry or rich mahogany, we produce staircases that express an appreciation for tradition and quality. Like fine furniture, our products begin with hand selected kiln-dried hardwoods. Technology is added to patient, skilled hands to produce stairs that will last for generations. Fox Valley Stair Company is your source for excellence in stair design and installation. Since 1988, Fox Valley Stair has been a leading custom stair company in McHenry County, IL. Serving southern Wisconsin, northern Illinois and the Chicagoland area. We specialize in the manufacturing of custom stairs and railings with meticulous attention to design and detail. New construction or remodeling, no project is to large or small. We are a family owned business, dedicated to superior quality and service. Creating breathtaking staircases and custom woodworking. Our workshop specializes in traditional carpentry and fine craftsmanship. We craft our staircases, cabinetry and furniture by hand with close attention to detail, tailoring each piece to suit your needs and offering you comprehensive advice along the way. We use only the finest materials when crafting your project. With Teodoro Brothers Stairs the customer has the luxury of dealing with the same person throughout the entire process of their project. From the esimate to completion. Which means no lost details or information, no run around, and most imporant to us is that the person selling you the product is also the person that makes it and installs it. Celebrating over 105 years in business, Roseland Stair Works is a family owned and operated company since 1914. We have served Chicagoland and beyond as the premier quality-crafted staircase and railing manufacturer for architects, interior design consultants, building contractors, and homeowners. Our showroom offices also houses our 30,000 sq ft. manufacturing facility. 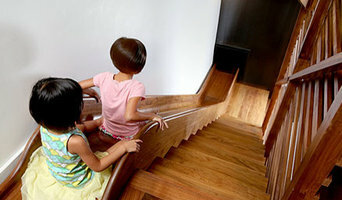 Let our family design your one-of-a-kind staircase creation or recreation. Much could be said about quality of the products and the workmanship that went into each Roseland Stair staircase. At the same time, we could boast about our fine service our customers have come to know. But what makes Roseland Stair Works unique is the people. It involves much more than a name or status, it takes people that are looking to make something extraordinary. It involves people that take pride in their vocation. It surely goes beyond the buildings that house our company, because it involves both our suppliers and our customers. If it wasn't for dedicated people who also have the vision to excel at their work, we couldn't look as good. For over a century, Roseland Stair Works has been the stair builder that has connected our suppliers with our customers, with a few people of our own. Our team personnel are dedicated to establishing a personal touch to each staircase they design, manufacture and install. We strive to excel in every aspect of the staircase business and are searching for even more productive and innovative approaches daily. The feedback from our team at Roseland Stair, along with our suppliers and customers, has found itself in the products that leave our facility and go into your home. We don't just create distinctive and unique staircases, we give you the team too! Visit our extensive website to see some of our award winning work. Royal Stairs is a family owned company that has been serving Chicago and the surrounding suburbs since 2003. At Royal Stairs we pride ourselves on providing personalized service and quality traditional craftsmanship. We work with builders, Interior Designers and the home remodeler, and as a small business, we guarantee that from estimate to completion our clients will be dealing with the same person throughout the entire process. Custom Hardwoods, LLC, has been the stair professional's choice for quality stair parts on the internet since 1997. We offer a huge collection of architectural stair parts for residential and commercial applications. Custom Railz and Stairz is an Illinois based, nationwide manufacturer of wooden stairs and stair parts. CRS works closely with architects, designers, builders, stair installers and homeowners to design and build stairways. We use the best materials, experienced workers and newest technologies to build a stairway that will please your expectations. mrail -Modern Stairs, is a Canadian company , opening a branch in Chicago. We make only minimalist modern stairs Our stairs feature clean design with no visible screws, brackets or welds, just stringers and steps. To achieve a structurally sound yet visually minimal structure our floating stairs are made from metal. Metal steps are secured to metal stringers. Glass guards are secured to metal steps. Wood or other cover materials are added later. Our extensive use of CAD drawings, CNC cutting, CNC machining and innovate technologies like patented step leveling hardware and adjustable glass standoffs allow precise geometry and least installation time. Installation typically does not require welding, cutting or grinding making our footprint at the job site minimal. Amron Stair Works is a manufacturer of interior wooden stair and rail systems. We are located in Gilberts, Illinois and have been serving the great Chicago area since 1984. We believe you will realize time and cost savings by receiving ready to install stair and rail systems, versus building stairs and rails from parts in the field. Amron offers stair systems from a simple carpet grade box to custom built stairs. We also have many types of rail styles to choose from, including iron balusters. We carry a variety of wood types and special orders can be accommodated. Installation is available on all custom stairs. At Dugan Wood Products, Inc., we design and install beautiful, high quality custom stairs and railings. Need to upgrade your existing staircase? We can remove your existing wood balusters and replace them with Wrought Iron Balusters. It is less expensive than you may think and most installations can be completed in 1 day. In addition to your new balusters we can replace existing stair treads and railings to complete the look!